Wedding is a long-awaited, happy day for a girl. In a beautiful snow-white outfit, she looks gently, elegantly and resembles a fairy-tale fairy. Unfortunately, the next morning on a gorgeous dress you can see stains from grass, lipstick, champagne and other dirt. The hem is particularly affected - it becomes gray from road dust. For a bride, a dress is not just an outfit that you can throw away after the wedding and forget. This is a memory for life, and he definitely needs to return the perfect state. Not every girl will entrust a precious outfit to dry-cleaning, so many people are concerned about how to wash a wedding dress at home. Our experts say that returning a luxurious look to clothes is not an adventure. To make it work, you need to do it on time. It is best to wash the wedding dress a few days after the solemn event. Almost any fresh stain can be removed without spoiling the delicate fabric. With old pollution more difficult. Markings from wine, juice, stains from cakes penetrate deep into the fibers of the fabric and eventually turn brown. Therefore, do not look for a long time how to wash a wedding dress at home. Do this while the stains are still fresh. These fabrics should be washed without heating the water above 30 ° C. Natural materials from contact with hot water can be reduced in size, and synthetic materials lose their attractive appearance. The recommendations of professionals, how to wash a dress with rhinestones, are that it should be done very carefully. With beads, beads, flowers when washing can peel off shine, they often fall off and spoil. If possible, it is advisable to unzip the decorations and sew or glue them in place when the outfit is washed and ironed. How to wash a wedding dress on which a lot of different spots? Need to buy a liquid powder for delicate fabrics. It quickly dissolves in water and destroys the most resistant dirt. For difficult pollution it is recommended to use laundry soap. Need to moisten wine stains or a dusty hem of sparkling water, rub with soap and leave on 10-15 minutes. Sweat marks are destroyed by saline. Stir in 100 ml of warm water 2 tsp. salt, apply to dirt and rub. Green stains from grass is easy to clean with ammonia. Measure out the 1 Art. l ammonia, pour it into 200 ml of water, stir and blot the spots. Wait until they are dry, treat with soap and rinse. If there is an ink stain on the fabric, sprinkle it with hair spray and wait 1 for an hour. Then wash with soapy water, the ink should move away from the fabric. Wash the wedding dress at home will help baby powder, if it remains stains from lipstick and other cosmetics. An hour before washing, dust with talcum powder, then they are well washed. In order not to spoil the outfit, do not use chlorine bleach for washing. It is easily able to damage delicate chiffon, silk or satin fabric, and leave yellow marks on dense matter. How to wash a wedding dress at home if he got only a long hem soiled? It will be necessary to fill a wide basin with warm water, pour 2 a cap of liquid powder into it or prepare a soap solution. Hang the dress over the basin and soak the hem in the liquid. Leave to soak for 2 hours and then wipe with a soft sponge and brush the edge with a toothbrush. Thoroughly rinse the lower part of the decoration, wait until the water runs out. Dry on a hanger in a well ventilated room. How to wash a magnificent ball gown with rhinestones that can not be unpicked before washing? You need to type in a bath of water heated to 30 ° C, pour the right amount of detergent and gently immerse the outfit there. Soak on 1 for an hour, rub the areas of dirt with your hands, gently clean the fabric with rhinestones and release the soapy water. Rinse the item must be at least 3 times, the only way to completely remove the powder. If a girl who attends a dance school is growing up in the house, there are many chic outfits in her wardrobe. After the next performance, mothers begin to put clothes in order and are looking for a way to wash a fluffy ball gown for children. To wash a lace airy wedding or ball gown without heavy accessories, it does not need to be soaked in water. Fasten it on a hanger above the bath and wet it with water from the shower. Treat the fabric with a soft sponge soaked in soapy water and remove the stains using the methods described above. Detergent wash with a shower hose from top to bottom. Try not to stretch the outfit so that it does not deform. Regardless of which method of washing the dress is chosen, it is forbidden to twist and wring it. Many girls are interested in whether it is possible to wash a wedding dress in a washing machine. If it does not have a large number of heavy jewelry, then this procedure is quite possible and safe. It is only necessary to adhere to some recommendations. The first rule, how to wash a wedding dress in a typewriter, is to use the program “silk” or “delicate wash”. Do not heat the water above 30 ° C, completely abandon the spin and turn on the “water drain” mode. If you do not, you can ruin the corset and then the dress will only throw. It is necessary to prepare an outfit for washing. It is desirable to secure jewelery made of beads and rhinestones with a strip of gauze or unpicked, and put the decoration itself in a fabric bag designed for washing delicate items. Load the bag into the drum of the machine, pour into the tray a colorless agent for lace and delicate fabrics, turn on the extra rinse and start the wash.
Place a spoonful of starch in the conditioner tray. This will facilitate ironing and make the outfit as gentle and beautiful as with the purchase. 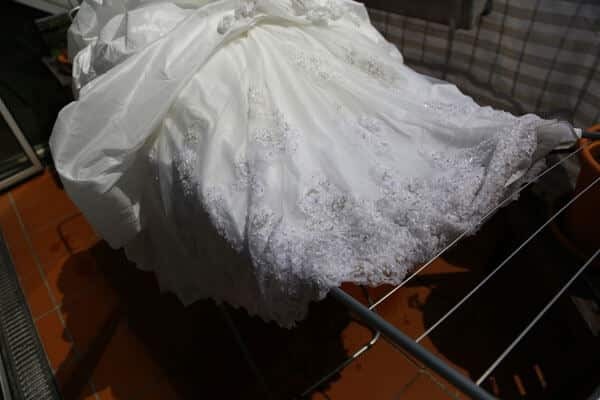 After washing the dress in the washing machine, it is necessary to get it out of the drum when wet, let it drain and begin drying. To festive clothing has not lost its splendor, it must be properly dried. An important condition for the preservation of the order - to do without twisting, otherwise you can damage the structure of the fabric. Some experts advise to dry the thing on a hanger. They believe that their own weight of the dress stimulates the smoothing of the folds, and they quickly straighten. But our experts say that wet outfit can change shape and stretch in limbo. Therefore, we recommend drying on a flat horizontal surface. 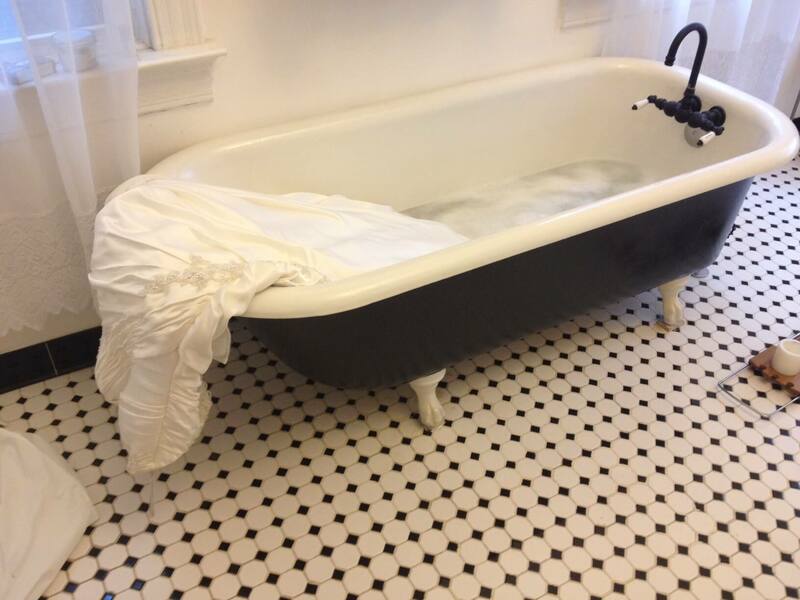 To do this, it is necessary to attach a special lattice to the sides of the bath, lay out the thing on it and wait until the water drains from the wet cloth. On a clean floor, put a large terry towel and gently place on it a dress made of organic cotton or silk. Straighten the folds and periodically turn the outfit so that it dries faster. After water drains from chiffon or satin dresses, they can be hung on hangers and left to dry in a draft or in the shade in the fresh air. Do not try to speed up the drying process by hanging outfit near the battery or stove. From hot air, it turns yellow and deformed. 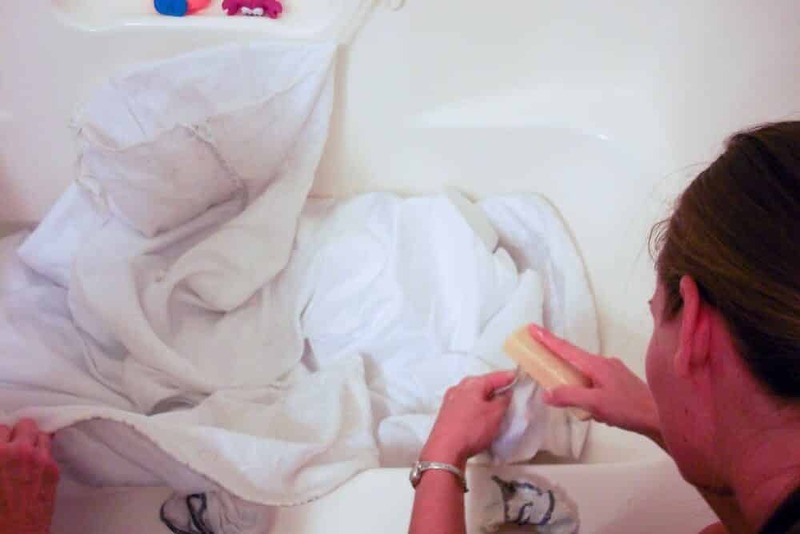 In order to return along the original appearance, the question is not only how to wash the wedding dress at home. It is very important to stroke him correctly. For safety, cover it with a white towel or a sheet. Examine the soleplate iron. If there is pollution on it, you need to get rid of it, otherwise black spots may appear on the dress. Put the iron on the minimum mode, turn the satin, lace, silk or cotton dress inside out and put gauze on the fabric. The process begins with a bodice, gradually moving to the skirt. At the end, iron the sleeves and small parts. For chiffon dressing iron is contraindicated. You will need a steamer. Hang the dress on the hanger and go over it with a stream of hot air. Start steaming from the petticoat. The steam will smooth out the most difficult creases and will not spoil the fabric. Stick to our recommendations, and the problem of how to wash a wedding dress at home will stop bothering you. After ironing, fold the outfit into a special case and place it in the wardrobe. There he will keep freshness and crystal whiteness for a long time. I had a silk wedding dress. And no matter how hard I tried, the long hem and train were still dirty. Washed the dress in parts. That is, first washed the bottom, and then the entire dress. Hem washed in warm, soapy water. Grated rubbed soap (white, not brown), carefully dissolved and foamed, added a little white laundry powder (with active oxygen) and some ammonia to the soapy water. I hung on the hanger over the bathroom and soaked. Hour and a half hem soaked, then rinsed (not pressed). And then in the bath all the dress was soaked in warm water in a liquid powder. Washed in the shower. And again, not squeezed, and hung to drain. Sushil on hangers in the room (most importantly, not in the sun, so as not to burn out).